What does that title even mean?? Today I printed a birthday part invitation – it was in two runs with clean justified type for Henry’s 40th birthday. Anne of Card Tricks Designs, my office-mate, was talking about color combinations one day. She had a client who wanted to use Orange and Blue. An oceany blue or kind of turquoise one. She instantly complained that she didn’t really like that combo, and wanted to shift the blue to navy or something. I actually like the original combo though it does remind me of the Miami Dolphins…. But then she revealed that Orange and that same kind of blue were her junior high colors. and that she always hated that color combo for that reason. It was at that moment when I figured it out. RED and white were the colors of the Marion Senior High School Hurricanes…. it is very clear. I don’t like straight red for the same reason Anne doesn’t. Incidentally, I also don’t particularly care for Kelly Green and white, the colors of Sugar Grove Combined School. Though I don’t really have a problem with Purple and white, the colors of Northwestern University. HMMMM??? I only can wonder if every graphic designer has the same feeling about their school colors. Maybe those formative years are just very color sensitive? In any case, here is a little starburst of sillyness I printed today…. testing out the red and white for Henry’s invitations…. This entry was posted in art, invitations, printing and tagged Color, printing, tiny pine on April 22, 2009 by tinypine. I have this very favorite paper/fabric cotton organdi…. 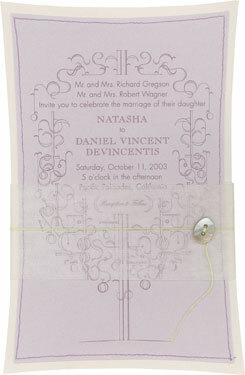 It’s the perfect fabric for wedding invitations because it is white, starchy, sturdy, translucent, and has just the perfect feeling… a little like tulle and a little bit like canvas… I have been using it for years… (here is my first wedding invitation for Natasha Gregson Wagner using a cotton organdi belly band). It comes in a few different colors but white always seems to be the best. However, sometimes white is toooooo WHITE. Blaring white is no good for organic handmade looking pieces. What to do? What to do?! Well, DYE IT!! That’s the answer. What a nice way to get back to my country girl roots, hanging out clothes on the line for the sunshine to dry. It’s kind of zen, creates a perfect embellishment, and allows the sun to do the rest of the work… oh, it’s kind of green, actually! This entry was posted in art, energy conservation, invitations, paper, wedding invitations and tagged Green wedding invitations, Jennifer Parsons, tea stained fabric, vintage on April 6, 2009 by tinypine. I know, I know…. it’s been awhile since the last post…. I have been very busy busy on lots of projects for the past three weeks! The other day I had a good reason to have a bunch of photos taken of my apartment… It was fun, mostly because I had a professional photographer, Joshua Targownik, snapping the pictures. He did an amazing job and took this particular one… (more are forthcoming, I promise) …. I wanted to talk about this understated set though it it probably understated compare to the rest of my colorful surroundings full of phones and flowers. I took a copper etching class a couple of years ago and found it completely delightful even though I am a letterpress printer for a living. It was a chance to play and make art completely without a computer (usually I do the artwork & typesetting on the computer and then print… you know…). Then using a very simple but wonderful process & press, I printed these on handmade paper. This is so yummy because the copper plate completely mushes the texture out of the paper, leaving the area around it smoooooooth. I love that part! yum! I mounted them on pale yellow handmade paper with a natural deckle and taped some string to the back and then I had two new pieces of art for my walls. Lovely! This entry was posted in art, photography, printing, Uncategorized on April 3, 2009 by tinypine.